Top Six Tips for Networking Neighbors Online was written on August 2, 2012 and filed in All, Inclusion, Issues Forums, Local, Minnesota, Neighbor Neighbourhoods, Technology, US. On the first Tuesday of August, ten of thousands of neighbors will gather block by block across St. Paul and Minneapolis and around the United States as part of National Night Out, Nite to Unite, and other similar events. Crime prevention is the name, but in our view community building is the game. 1. Gather E-mail – Pass around a sign-up sheet like this (template) to collect e-mail addresses, mobile/text numbers, etc. Text messaging on very urgent matters with neighbors is a new opportunity. Alternatively pass around a flyer people can read (example). 2. Create Directory – After the event, type up a simple directory of neighbors who shared that information and e-mail them a copy. Print copies for those not online. You don’t want to exclude often older or lower income neighbors. 3. Connect Simply – Send everyone a cc: message so at the most basic level people just “reply to all” to people on your blocks. Millions of Americans connect in simple ways with neighbors online. It doesn’t need to be complicated. 4. Gather Ideas, Be a Connector – Join Block Connectors the new online group for people who want to make their block safer and more connected. While police departments will share information with you one-way about building neighborhood watches, etc. this online group can connect you peer to peer with other inspiring neighbors like you ready to make a difference on your street. 5. Network Nearest Neighbors – Consider creating an automated private online group for your block or two … let’s call these “electronic block clubs.” You can do this using tools like Facebook Groups (some cautions), Google Groups, YahooGroups, etc. or check out some specialty tools. Simple e-mail lists seem to work well for most. Because Facebook Groups are really e-mail lists in disguise when under 150 members, they are increasingly popular. Unfortunately, the crucial ability to “add” not just “invite” someone from a paper sign-up sheet is now not supported by these services. E-Democracy is piloting electronic block clubs and testing different open source technologies. Contact us if interested. With our system you can crucially “add” people with their permission on paper sign-up sheets you can take door to door. If you want to create a public online Neighbors Forums request one here. Our largest neighborhood networks reach over 1,000 people daily and are approaching 25% of households. 6. Keep Having Fun – Don’t let your block connecting momentum slide. Set a date for a winter potluck. 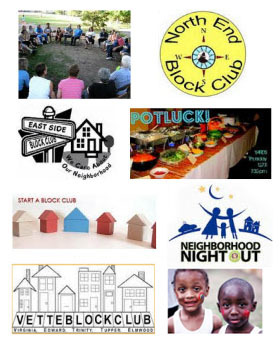 We are proposing the Great Potluck the week of January 15 when our neighborly warmth can counter the cold and dark. Join Block Connectors to get involved. Or explore one the many block activities on this mega-list. What is missing from this list? Add your ideas in the comments. For similar ideas, see this article we wrote in 2004 before brought our online townhall model to the neighborhood level. Neighbors Online – What have 27% of Internet Users Discovered? Women Lead the Way. Need More Inclusion.